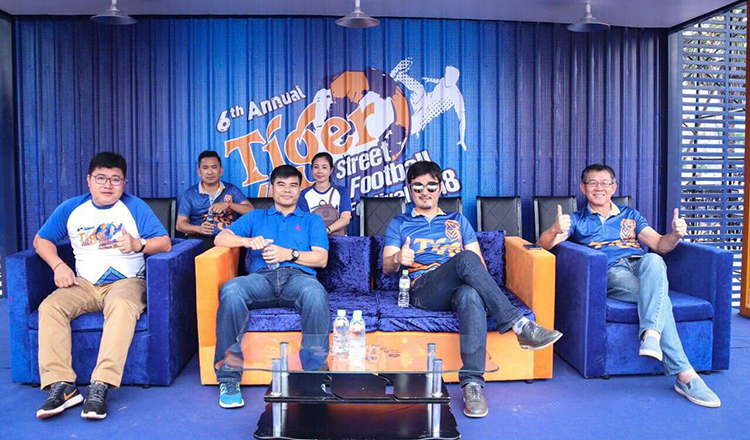 As the grand final of the 6th Annual Tiger Street Football Festival is fast approaching, there were plenty for fans to shout about in Poipet as it played host to the fifth stanza of Tiger’s captivating futsal roadshow. At the start of play on Saturday morning, an impressive turnout saw teams competing for qualification for next months’ grand final in Phnom Penh. After navigating a lengthy knockout stage Family FC (A) and Poipet Empire (A) were drawn to meet in yesterday’s provincial final. It was Family FC who came away with the win – and the plaudits – in a close contest against their rivals. In a final full of goals for fans to celebrate, the two sides went into the half-time break level at 3-3 and were closely matched. With the game finely balanced at half-time, it was Family who dug deepest to score an unassailable treble late in the half to secure a 6-3 win and the top provincial prize. 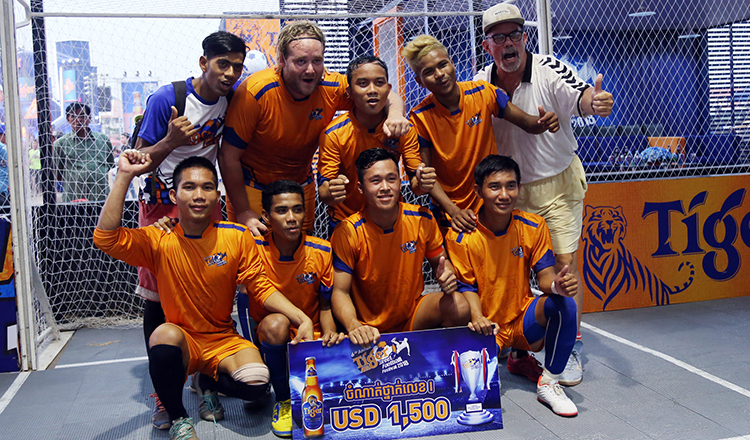 At the full-time whistle, a prize of $1,000 and a tickets to the March grand final in Phnom Penh were handed out. The runners-up received $700, while third place were awarded a $350 prize. After celebrations were over and prizes had been dished out, renowned musicians including Khemarek Sereymon, Ouk Sokunkanha and DJ Maily took to the stage to entertain the crowds into the evening. With a total prize fund of $50,000 up for grabs, next up are teams from Kampong Cham and Kandal, to vie for a berth in next month’s grand final. After taking in Sihanoukville, Kampong Speu, Battambang, Siem Reap, and now Poipet, the tournament heads to Kampong Cham next weekend for the sixth part of its remarkable festival of football. Ex-Manchester United winger Ryan Giggs, the most decorated footballer of all-time, is set to visit Cambodia for the grand final and teams will be vying for a chance to share a futsal cage with the Welsh wing wizard. 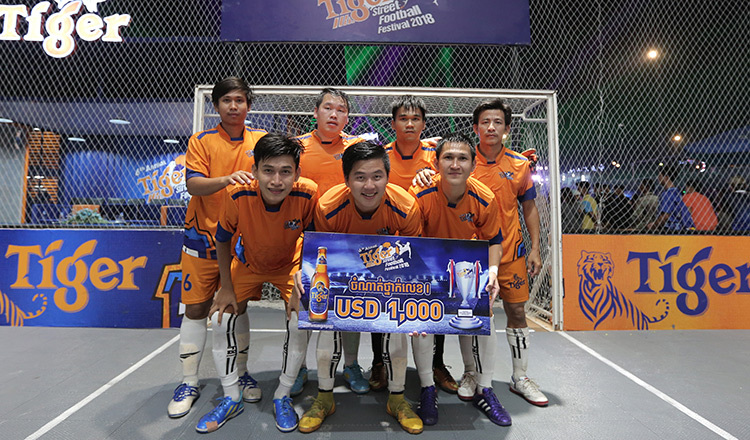 Tiger Street Football Festival 2018 is organised by Tiger Beer to connect with youths in Cambodia and extend its footprint towards developing football in the kingdom. It also serves as a platform for talented players, aspiring footballers and anyone with a passion for the game to showcase their talent, exchange pointers, and learn from good players. The Poipet leg of the competition saw a surge in team registration, with the over 50 entrants condensed into just two-days of competition. Organisers praised passion for futsal among the provincial youngsters, with representatives from Tiger Beer adding during Friday’s press conference that increased fan participation at this year’s competition was pleasing to see and bode well for the sport’s growth in the kingdom. With the grand final now a little over 15 days away, teams will be ramping up their practice as they gear up for the biggest futsal final Cambodia has ever seen.